On Sept. 17, the Notre Dame Institute for Global Investing hosted Patrick O’Shaughnessy, Principal and Portfolio Manager at O’Shaughnessy Asset Management (OSAM) who is also the host of the successful podcast “Invest Like the Best” and author of the book Millennial Money: How Young Investors Can Build a Fortune and of the blog The Investor’s Field Guide. At OSAM, O’Shaughnessy’s responsibilities include investment strategy research and product development. He generates new research to enhance investment strategies through stock selection, portfolio construction, or asset allocation. In addition to being an equity owner in OSAM and a member of the firm’s Executive Committee, O’Shaughnessy holds a B.A. in Philosophy from the University of Notre Dame and is also a Chartered Financial Analyst. O’Shaughnessy presented “Frontiers in Asset Management,” focusing on understanding how to value investment opportunities, particularly those involving new companies or ideas. O’Shaughnessy opened with an anecdote about Eric Maddox, an army interrogator who unexpectedly landed on a mission to locate Sadam Hussein in Iraq. At a time when much of the military’s interrogation tactics relied on “force and coercion,” Maddox experimented with a new strategy: kindness, empathy, and connection. This strategy caused a 65% jump in success rate. This example was meant to illustrate how O’Shaughnessy believes an essential part of success in the investment industry is the desire to understand a company’s motivations behind their practices. He discussed the essential questions to ask in asset management, including appropriate valuation and how to identify mispricing. While in the investment industry the term “frontiers” can include innovative new companies on the cutting edge of the market, O’Shaughnessy also touched on how the concept of “frontiers” is applicable in many facets of life. 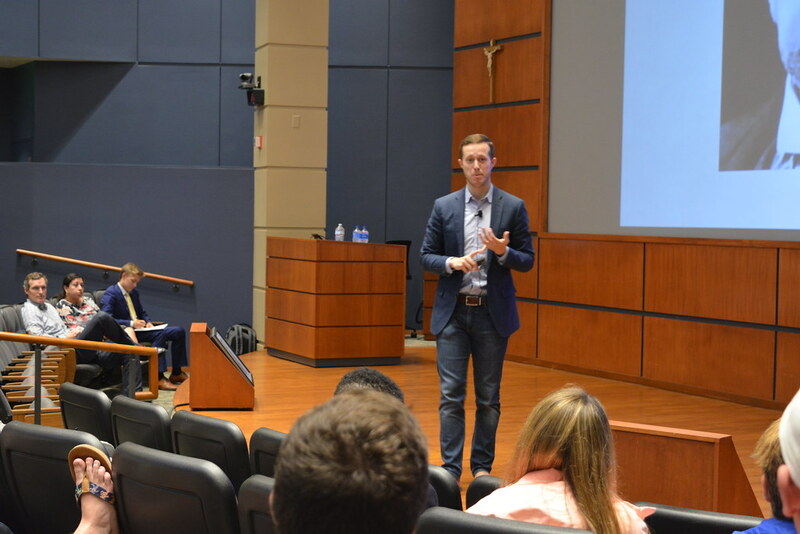 He defines a frontier as “some new area of exploration for which there is no playbook.” Therefore, he encouraged students to master the core skillsets but to also make sure that they are constantly growing and adapting to new markets and strategies. He closed his lecture by sharing some advice to the student audience. He encouraged them to spend time doing things they enjoy, saying that he himself spends two or three hours in the woods each day. He also recommended reading eastern philosophy, crediting his undergraduate degree in philosophy with helping him set up his future. Lastly, O’Shaughnessy told the students not to short sell their skill sets and be confident in their abilities.